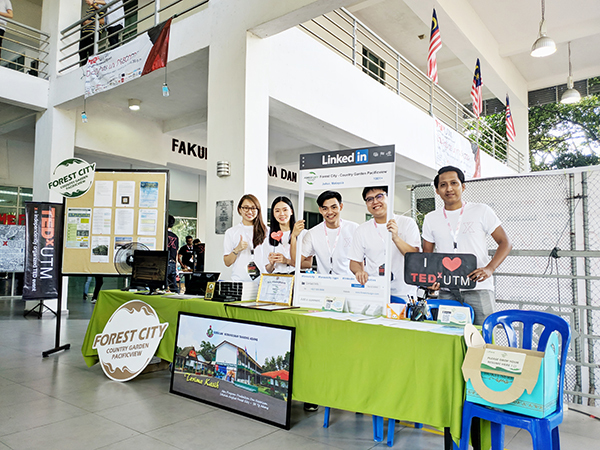 TEDxUTM 2019 was recently held at the Faculty of Built Environment and Surveying Convention Hall, Universiti Teknologi Malaysia (UTM). Being its third year holding the talk since 2017, this year’s theme was ‘Thoughts in Resonance’. Extending their original intention to bring in ideas worth spreading to their local community, TEDxUTM had invited Country Garden’s Ng Zhu Hann, UTM’s Dr. Ramesh Zaidi Rozan, Dr. Vanlal Thanzami, Greenman Matthias Gelber, Ir. Ammar Mohd Rashid, travel vlogger Drew Binsky, Warren Mak, Lenna Lim, Saran Mutang Tagal and Karen Foo. Drew Binsky, the Youtube travel sensation talked about travelling and getting out of his comfort zone and Country Garden Malaysia’s Chief Strategist’, Ng Zhu Han took the stage right after to share about the ratio of hard work and luck, striving for excellence and bigger challenges. Forest City Resort by Country Garden Pacificview Sdn Bhd was also the accommodation sponsors for the speakers of the event. Dr. Vanlal Thanzami enlightened the audience on social media and cyberbullying. UTM’s Xcite Director, Dr. Ramesh Zaidi shared his success story of facing multiple rejections to enrolling into tertiary education. Meanwhile, the activities prepared right outside the hall was just as exciting, with J Empress Bakery Studio holding its cupcake decorations all day, using fondant icing to make a graduation cap professionally guided by their pastry chef representative. Actress Lenna Lim shared her journey on changing her path from music to acting and has since built a prolific profile in her career. Warren Mak helped the youth see how to manage their finance from the beginning of their career and Greenman Matthias Gelber suggested how to fix our habits as hotel guests by being a lot greener by sharing 5 simple tips. Ir. Ammar shared quick tips on how to impress employers when students graduate and are in the job hunt run. Whereas, Saran Mutang Tagal of Lun Bawang heritage shared the risks of changing her career in law to pursuing her passion and opening a DIY crafting business. Finally, Karen Foo the motivational speaker prepared students on how to accept failures before achieving that one goal in mind and the importance of perseverance in attaining success. Other activities outside the hall included Makeup Class by Mary Kay partners, Board Games Exhibition by Austin Heights’ Gen Board Game Cafe and Crazy Bull Ride from Paradigm Mall. The TEDx talk event ended well with a networking and photo session. 15th Johor Arts Festival this September!